How often do you get chance to sit down and relax? Why not pamper yourself and enjoy a couple of hours letting your cares float away as you concentrate on creating something beautiful. We supply everything you need for a relaxing time at our ceramic studio - all your equipment and painting supplies (stencils, stamps, sponges) as well as hot and cold drinks and snacks. You'll be amazed at what you can create and how much fun you have doing it. Create a unique gift or just have fun! Our friendly staff will talk to you through the process, starting with choosing a piece of pottery (also called "bisque") to paint. You can look through our wide range of books, stencils, stamps and picture cards. Or ask one of our staff for ideas. You don't need to be able to draw - stencils and stamps (or simple patterns) can make beautiful finished pieces. When you've finished your masterpiece, we'll glaze it and fire it for you. Not at Barefoot! We are happy to suggest painting styles for all ages, children and adults. Why not mark a child's birth or birthday with a hand or footprint piece. Our staff will help you print the little one's feet or hands and you can finish off the piece with name, dates etc. For your peace of mind we only use paint that is completely non-toxic. We also provide baby changing facilities. 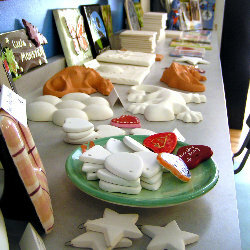 We offer special rates for children's birthday parties which include all bisque, paint, glaze and firing. We can also provide food at an additional cost. Booking is required. If you have any special requests or requirements,we will be happy to chat them over with you. Look out for our special events throughout the year, some just for children! See in store for details or drop us a line.